We would like to thank the Action Mobility Foundation for the grant that allowed me to purchase an Action Trackchair for my son Dustin. On March 30th, 2005 when Dustin was 28 years old he was in a horrible vehicle accident. Two set of First Responders arrived at the scene. The 1st set pronounced him dead at the scene and called the coroner. The 2nd set found a pulse and called med-flight. Dustin spent 59 days in a coma at the Trauma Life Center at the UW Hospital in Madison, WI. Dustin finally opened his eyes and over the next year progressed enough to talk, feed himself and get on with his life. He now lives in a group home with 3 other roommates and 2 staff. The accident left Dustin with a brain injury and no balance. Dustin can stand if he can keep holding on to something - as soon as he lets go he would fall to the ground. Before the accident Dustin loved to hunt and fish. There was a time during his recovery I thought Dustin would never do these things again. Then we saw a Trackchair. We first saw it during a demonstration at a day center for the disabled. We fell in love immediately. The problem was affordability. On your website I found an application for an Action Mobility Foundation grant. Thanks again for providing this grant allowing us to purchase an Action Trackchair. We've had it out a few times and it more than meets our expectations. Looking forward to this fall when we can get out hunting. From the first time I used this chair pheasant hunting to my most recent time rolling in the marsh with my family enjoying nature, I have loved it! I have experienced a renewed love for nature because I am allowed to be independent and have access to landscape I used to walk encountering nature without the help of others. I have used it hunting for turkey, pheasant and whitetail deer. This chair allows the ability to access the woods for more successful hunting and bird watching. One of the features I love most is the ability to tilt with the slope of the terrain so I am comfortable and feel safe. This newly founded access i rejuvenating! I believe in it so much that I volunteer to help others experience it too! Our chair is beyond a blessing seen many places . Top Lake Michigan from the U.P. the littles love to sit w him and our kids get to still walk the beach w dad , to tractor shows in Pennsylvania but especially great in mud and has had to pull tractors w it. To camping at the sand dunes including climbing some . It has afforded him to do a lot of things he may not been able to otherwise . We are extremely grateful for this chair and know how privileged we are to have it is never taken for granted . Hopefully there's a way to get more resources to help people to receive them. In 2007, a shallow water swimming accident forever changed Dustin P’s life. 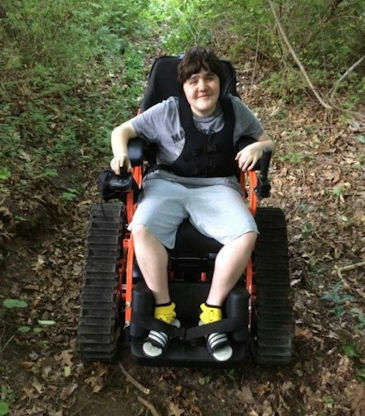 He longed for the day when he could get back into woods and rough areas without getting his regular wheelchair stuck in the mud before he got very far. 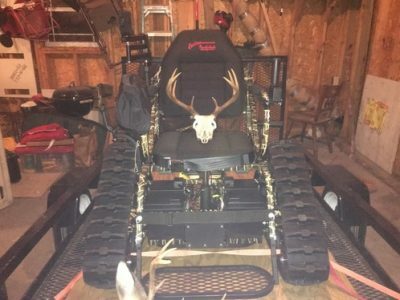 Now, his brand new Action Trackchair has made it possible to head out and search for deer antler sheds and to collect fire wood for the family fire pit. He reports that his kids got tired during one such outing long before he did! Dustin plans to visit as many of Wisconsin’s state parks as the weather gets nicer. In addition, he will get out his fishing gear for some trout fishing streams that had been impossible to reach earlier. 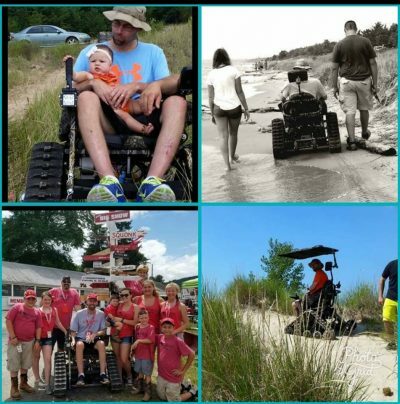 A grant from Action Mobility Foundation helped to make the new Action Trackchair a reality for Dustin. He plans to use it to help with chores on the farm where he and his fiancé raise chickens and pigs. The action track chair has opened up a new world for Brik. He has been able to go places independently that otherwise he had to rely on others to take him. He gets out in it every chance he gets and has such a blast! The Action Trackchair has allowed me to hunt in a way I haven't been able to in years. I can get to my location of choice and even track a deer on my own! I no longer need to depend on other's schedules as to when I can get in the woods! Kurt is enjoying his new Action Trackchair so much. We took him out to the gun club he and his dad belong to. He took his new chair and went all over in the tall grass. All the time just having a ball and laughing because he was enjoying it so much!! Since I received my Action Trackchair it has opened a whole new opportunity for hunting for me. 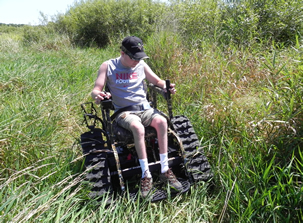 Prior to my Action Trackchair I would use a power wheelchair or a UTV. Now I can get in places that I couldn't get with either and I don't have to worry about getting stuck. 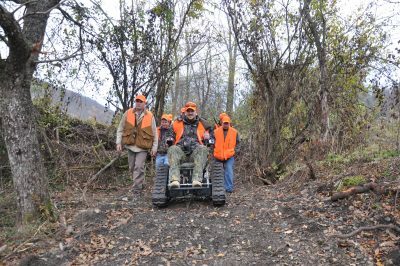 Last deer season, using my Action Trackchair I shot a deer that was located where I would never have been able to get to before, but my chair got me there! 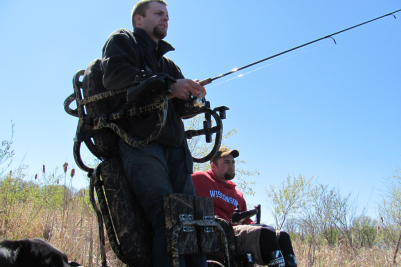 The Action Trackchair whether used for hunting, fishing or just getting into the outdoor is great! Even my grandkids like to get ride when we go for a stroll in the woods or down by the creek. ​I've had my Track Chair for a little over a week! It's everything I expected and then some! Thanks to everyone involved in its development! We describe Landon as very Adventurous. He is a young boy that wants to go places but isn’t always able to with his everyday power wheelchair. Especially in the woods or off road! That is when we got serious about getting him an Action Trackchair. For three years we looked at, sat in and asked Chad questions about the chair at the deer/turkey expo. A few weeks later Landon was trying out a model in our front yard with the help of Chad sharing his experiences. 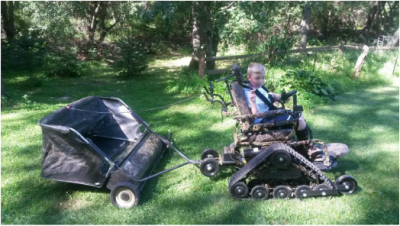 Two months later Landon was proudly driving his very own Action Trackchair! In a short time the Trackchair has opened up some opportunities to be even more adventurous and a part of things. He helps with family chores picking up grass and kindling with his sister. He recently went on a bear hunt and was able to get to the hunting site on his own through the swamp with “Mr. T” (that is what he named his trackchair!) We even made it to our blind opening day of deer hunting through the snow. 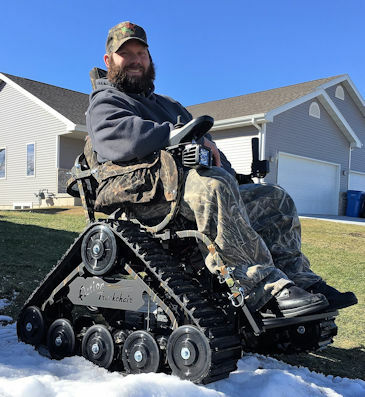 One of his latest endeavors is to come along pheasant hunting and to film the hunt with a helmet cam while maneuvering through the field in his Action Trackchair. This weekend he did something in his chair that warmed my heart. While in our front yard he proceeded to drive out into the snow. He seemed to have a purpose but I didn’t pay attention as I made made our traditional family “snow buck.” He finally got my attention and to my amazement he had created artwork in the snow with his Action Trackchair. He had created his own deer. Antlers, body, legs even eyes and a mouth by using the tracks and doing donuts in his trackchair. Without the Action Trackchair he just sat and stared from the driveway but now he was the one creating a new tradition for our family. “Chair art in the snow.” Our family is very blessed to have met Chad and been given the opportunity to be more adventurous together! After my injury I didn't think I would ever see the outdoor the way I'd grown up with and loved. But with the Action Trackchair I'm now able to motor throw brush and over tundra by myself. This freedom is something I have been dreaming about since my injury, I need help getting in, but then I'm free to choose my own path. This Action Trackchair has greatly improved my attitude for life. Thank you folks at Action Trackchair for building such a tough and capable chair. My wife is the same but her world has changed since she met you!! Now she is out and about and you cant stop her from anything. She even rode the machine through the Lowes Hardware one day, Its amazing once she is in it she has her freedom back. She has been through a baseball season and a football season for the kids this year and if that chair fits she is rocking it" Everyday she is on that thing from getting the kids off the bus to playing the yard it has changed the whole families life- it is such a blessing! The action trackchair enhances Nicolas' life to participate in outdoor actives that his wheelchair will not allow him to. Nicolas can now go onto the beach with his sisters and chase the birds, go hunting with his father (this is a pastime that has been done for many generations) and go on trails with his cousins. The smile on his face when he is in the action trackchair doing the things he loves is priceless! We are a one income family and the grant helped us purchase the action trackchair for Nicolas. Thank you so very much!!!!!!! 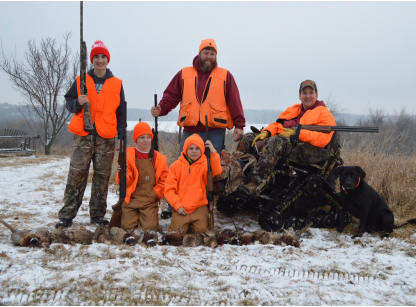 Thanks to the Action Trackchair I was able to take my son and nephews on their first ever pheasant hunt last winter. We had a blast. I am a veteran and while I was in the USCG I was diagnosed with Muscular Dystrophy. I am an avid outdoorsman, have been all my life, but in the last 10 years or so have become limited on what I could do, and where I could go. 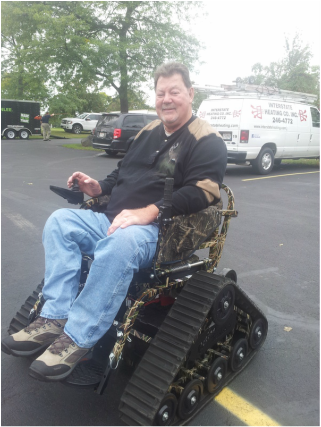 I learned of the Action Trackchair from a friend who had been at an outdoor show in Michigan, and through the information he gave me was put in contact with Brian Reno. Brian had told me about a couple of avenues to explore for assistance in purchasing. and after the application process with one of the funds I was referred to I was awarded an Action Trackchair. My chair was delivered and I was trained on all of the ins and outs, and have been enjoying it ever since! I have used it with family around the property, to flush birds, to fetch the mail, to deer hunt and even used it to drag out a deer! The chair is very capable, sturdy, well built and I know there was and is a lot of thought, engineering and passion poured into building this product. I am proud to have one and will be a big advocate of the Action Track chair, TSS Equipment, and Brian Reno! God Bless you for what you do and what you stand for, thank you from the bottom of my heart! My friends and I take the outdoors very seriously. 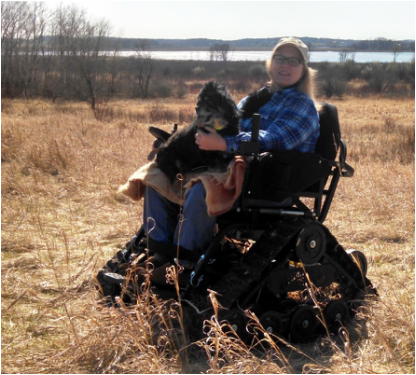 After my accident, leaving me paraplegic, my biggest fear was not being able to enjoy the outdoors. 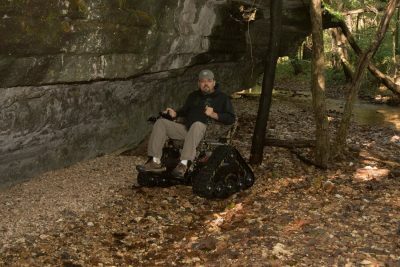 The Action Trackchair has given me the freedom to take the outdoors just as seriously as I did before. 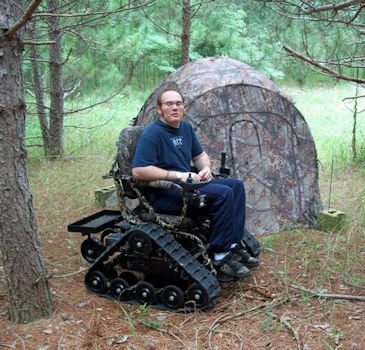 Whether in the woods or down in the swamp my Action Trackchair gets me where I want to go! 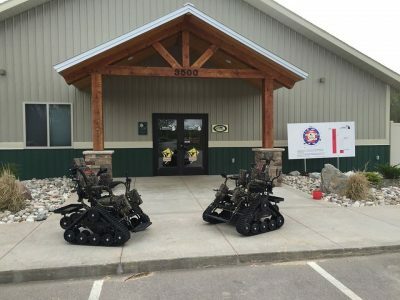 We at the West Michigan Archery Center are thrilled to have two Action Track chairs at our center, so we can share our outdoor archery areas with even more people! The difference between attending outdoor activities and being fully involved in outdoor activities has been the use of a Action Track Chair. For 33 years I have been attending snowmobile snow cross events across the upper Midwest and until this year I have always been "placed" in the best viewing spot but that is where I stayed. With the use of the Action Track Chair I was able to move about the entire race course and roam the complete pit area visiting with friends like never before. I cant wait to use the Track Chair this spring and summer. It has been over 30 years since I have been on the beach next to the water without being stuck in one spot. My family and friends have always kept me involved in outdoor activities, pushing or pulling my wheelchair through the roughest terrain and to the most remote locations imaginable. Now I can go to those same spots and further on my own. My Family and Friends thank everyone at Action Track Chair.